By The Mouse Team January 14, 2018 March 27th, 2018 Blog, What's NEW/NEXT? 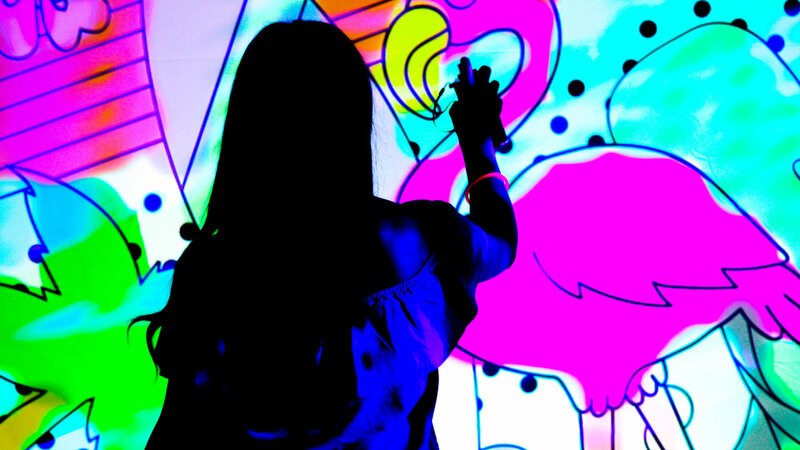 Light up your next experiential marketing brand activation by turning this giant 10-foot wide interactive screen into a digital colouring book canvas. Light up your next experiential marketing brand activation by turning this giant 10-foot wide interactive screen into a canvas for digital painting. Guests grab digital spray paint cans and create their own artwork — either painting freehand, or over custom colouring book pages designed in advance by our team. Paint can be blended like real spray paint to allow for anything from simple colouring-in to intricate mural art. Guests can colour a page in just a few minutes. We’ve also used it for longer performance pieces with artists creating something extraordinary over the course of your event. Guests can share their creative work via email or social platforms, or have it printed onsite.